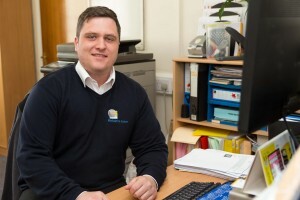 Simon has worked at Yorkshire Laser for eight years – one year in the factory and seven years in his current role. The archetypal man who has worked his way up from the shop floor, Simon undertook an apprenticeship and has worked in welding, fabrication and sheet metal work all his career. He cites being part of a growing sales team which is continually helping the company to expand as his personal success story at Yorkshire Laser. Growing up Simon wanted to work in Leisure and Tourism but decided that learning a trade would be more practical. This career move was probably for the best as he confesses to Jack Daniels being his guilty pleasure – less easily accessible in manufacturing! Simon is a Leeds United Fan but also enjoys going to the gym and gaming. If he had the money he would buy a boat and sale off into the sunset!